Yeah, I know, I’m really busy and didn’t have time to create another post, hope to have time to create another one soon, if you have any ideas for the next post, please, leave a comment with your request. YEY! Yes, I was lucky enough to buy the ticket before it ran out, horray! 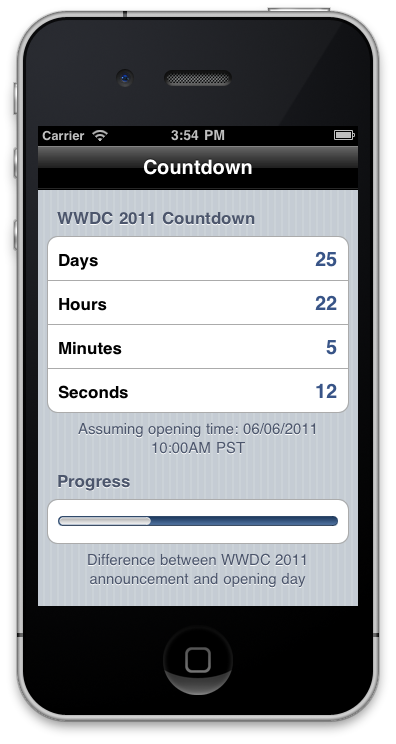 And since I can’t wait for it, I developed some simple WWDC 2011 countdown app, so I can count the seconds for it. I assume that the opening will be at 10:00AM PST, same as last time, but there’s no official opening time that I know about it. Anyway, this is the app screenshot, and if you want to install in your device, fell free do download the source code here. Fell free to modify, change, and do whatever you want with this project.